I went to Five Guys burgers and fries last night in Brooklyn Heights. They had just opened, this being their first Brooklyn location. They also have a spot in Queens. I know this chain is extremely popular in the mid-Atlantic area, but I wasn't terribly impressed by either the burgers or the fries. The burger meat was tasty, although they give you two patties instead of one larger burger (you can also order a "mini" which is just one patty) and they also include your preferred condiments on the burger. I am a burger dipper and much prefer a dryer burger and little sides of mustard and ketchup for dipping per bite. Too many condiments equal messy burgers. Which brings me to the bun. 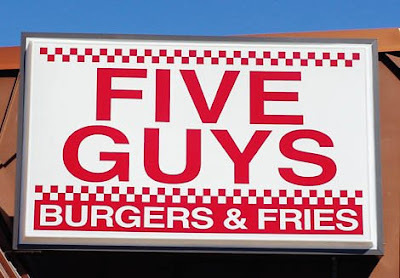 That to me is the greatest weakness of the Five Guys burger. The bun is mushy and bland. Whatever criticism people may have of Shake Shack, one has to admit they have the bun down to perfection.